Welcome to coffee Monday! Maybe some of you are thinking, “She’s crazy, every day is coffee __day!” Not for me…haha…as I’ve mentioned in past posts I’m not a huge coffee drinker, but I do love finding cute places to hang out, write, and drink tea or coffee. 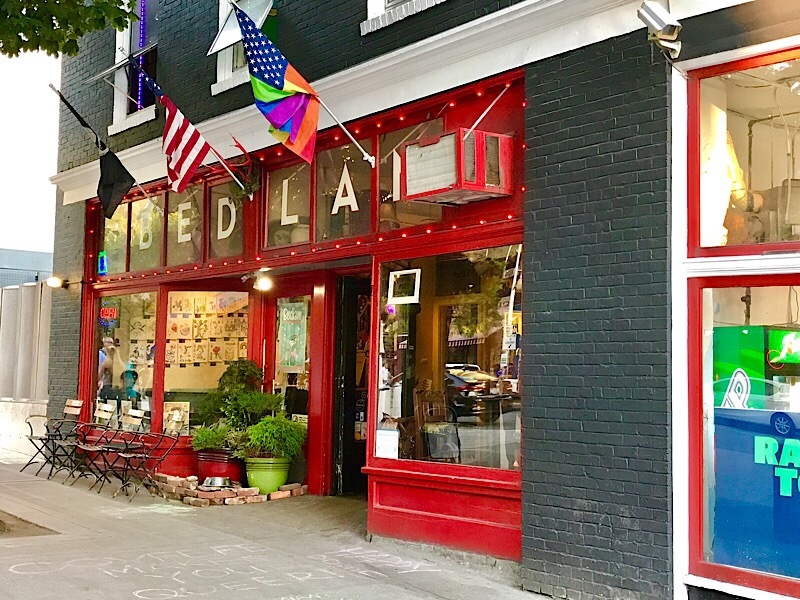 Today it’s a trip to Bedlam Coffee, this gem can be found on 2nd and Bell. I super loved the chalk drawing that was on the ground. When you walk in you are greeted by some very friendly servers who will very patiently wait for you to make your order. The menu itself isn’t crazy long, though I’m sure you can make your own drink, vanilla, half-calf, doppio or something crazy like that. I ordered a macchiato. If you aren’t familiar with a macchiato it is espresso coffee with a splash of milk foam. I ordered this so I could get a feel for the flavor of their beans. And…it is a nice level of bitterness, not burnt, but definitely bold in flavor. Some interior shots, they also have a spot upstairs, though I didn’t go up there. Vibe: I’m here on a Monday, but I could see this place being a bit louder on the weekend as they are open until 10 PM and they offer quite a selection of board games. The vibe, to me is relaxed and laid back. A great place to relax and get some work done. They have seating outside, on the first floor, and on the second floor. Cleanliness: The tables were all cleaned when I got in. Service: I was greeted as soon as I walked in and they were patient enough to wait. They also noted that I could take as long as I want, well, until 10. Flavor: The espresso is really nice and strong. Is it worth it: They also had a great list of tea lattes (my favorite), so I want to definitely try one of those next time. The macchiato I had I really enjoyed. What a cute little shop! Yes, it has a really nice feel to relax in. Ooh, it sounds like their coffee has improved. Their cinnamon toast is AMAZING. and probably has a day’s calories of butter in each slice. Yeah! It was my first time there. I preferred Anchorhead, but this place is pretty good!